A report from my trip to England in which I fall in love with England through my mother tongue and must promptly extricate myself for fear of losing my edge. It was Freddy who started it; this journey quest to England in search of the next step, not that I knew what that was exactly. I was aiming for spiritual advancement, but it could just as easily have amounted to a rabbit hole of arcane, academically dubious material. New Age types are not given to vigorous, intellectual analysis, but when I heard Freddy's English accent, I felt in the hands of someone who was educated. Americans are apt to attribute an education to nearly any kind of English accent. I benefit from this mythology all the time, but Freddy spoke the Queens English as it is heard on BBC (and at Harry Potter's Hogwarts). Freddy had been the opening act of The Prophets Conference on 2012, which I attended in Palm Springs last March. 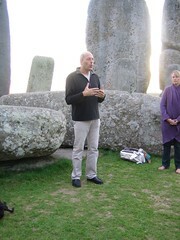 I was so intrigued by the sacred geometry of ancient sites in his presentation, that I examined the 5 day tour he was giving to see if it would justify the peak season airfare to England. I decided I could manage it, if I slept in a tent. At this point Catherine got interested, said she would come along for the ride, wherever it was I wanted to go as long as I planned it. Catherine was not the vagabond, tent-traveling type, so I wrote friends in England who might be pressed into putting us up. With only three months to prepare I plotted out a two week trip that linked visits with friends, inexpensive B & Bs and rail travel (offered at a discount if booked exactly to the day and time of travel). This coordination tested the limits of my event planning skills, but I was satisfied that it was feasible. But it was true, England had not really changed. There was the rolling sheep studded countryside still unspoiled, the pubs and villages, public footpaths and miles of train transport. I was reminded, again, of how the built environment can affect a way of life. The British, on the whole, knew enough not to spoil it. It seemed to go hand in hand with their uber politeness as they waved thank-you to the motorist who paused to let them pass on those tiny country roads. A far cry from the competitive Bay Area traffic and soul, sucking concrete business parks of Silicon Valley. Even San Francisco, beautiful as it is, was said to be the least friendly to visitors in the entire country. When I read this, I vowed to personally change this attitude, along with the snarky online presence that had somehow spawned out of our geek speak. But then, last summer I nearly ran over, with my bicycle, some annoyed Midwesterners in a cross walk, while attempting to beat out the car traffic along the San Francisco waterfront. Given a little wider road, I could see that British drivers easily picked up speed, too, leaving pedestrians at their peril. 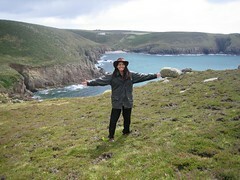 Our first landing, in England, would be the home of my American friend Gail and her English husband, Clive. When they met us at the airport, she hugged me for dear life and burst into tears. She was lonely in England. The English had not quite embraced her as one of their own even after 22 years; her emotional style overwhelmed them I could see. The British reserve had not changed and Gail was at a loss to penetrate it with her New Jersey born, American Italian exuberance. 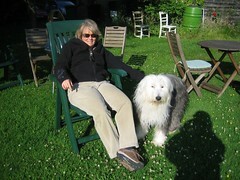 Even with the help of her English Sheepdog (for the English go completely soft with their dogs). 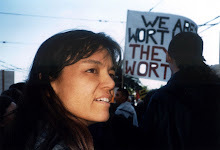 Gail was intuitive based and not the least bit cerebral so had no irony or deftness with words; she liked to call it like it was and wear her heart on her sleeve. All, so not English. She did, however, match the British in understatement. "Our spare room is not much, but it does have a nice view," she had written me. The view was a stunner—rolling, sheep-studded, countryside as far as the eye could see and not a building on it, just classic hedgerows dividing up the fields. Catherine spent everyday sitting in a chair basking in the late evening glow as though at the beach. It was so quiet we got the rest we needed too. In the morning we could hear, through our bedroom window, sheep bleating. Gail and I had worked together back when I still had a day job. She met Clive when he came to California seeking a business opportunity. When the deal fell through, Gail and her youngest daughter Courtney, moved to England with Clive. Courtney also married a Brit and now had a little girl whom Gail doted upon. All three saw each other everyday while selling their Nirvana Natural line of herbal shampoos out of the home office. Clive drove around to clients cutting hair. In the evening he treated us to home cooked meals and brought out his cockatoo to do tricks for us after dinner. Clive was a character in the truest British sense, eccentric, passionate about topics of interest and devoted to his hobby of making models of English villages from scrap materials, recycling the styrofoam that meat was packed in. Built to a 4mm scale they were uncannily accurate. Having an absorbing hobby, he told us, was the key to mental health. It was Clive, who happily filled us in on his home town of Henley, plus various opinions on the Royals and politics. He was proud to show all his favorite spots telling us the literary and movie making trivia of each destination. There was also, on top of his patter, another layer for me to tune into. That of self reflection—of seeing oneself in the context of a larger world. His perspective automatically included the countries of Europe and the States. The UK was, Clive told us, the bridge between Europe and the West—the US. He commented on how speech patterns tied in with identity. "The British answer a question with a question, don't you see?" he explained. As I listened to him I realized that he, too, had constructed in his mind a big picture of how the world worked. The whole world. We probably wouldn't agree on everything, but at least he had such a world view. At home my mind was too often corralled by the high fences of the American point of view, seemingly unable to picture anything beyond the two coasts (while Mexico was blocked off by a real wall and Canada seen as part of our English-only North American identity). Because of this, I felt it was difficult for Americans to see themselves in the international arena as the heavies in a world empire. Public discourse often framed the US as the underdog, vulnerable to attack at any moment from savages who didn't understand our "freedoms" (and our economic free market rightness), while conveniently ignoring Europe, an already democratized entity (with civilized social services like health care). Meanwhile, context in America was so sorely muddled by the shouting heads on right wing Fox News and wordy liberal ideologues on the left, rendering the average American delusional. (Most Americans would agree with me as long as I was talking about the opposing political party.) As it stands, nothing sensible can be discussed to address real problems. It was this polarization that would make me itch, periodically, to leave the US and seek an alternative view. On our last day in Henley, I found that I had the wrong train ticket for the station we would depart from. Clive roll played for me how to be thoroughly indignant at the ticket office while stating my case as having made every attempt to play by the rules of the system. "Shut up, Clive," said Gail when he repeated this performance for the third time. It was so well thought out, it could have been a Monty Python skit. If I could just drum up such a head of steam. (Thankfully no one even asked to see the ticket at the station and once we got on the train the ticket matched the train.) We bid our adieus vowing to come back much sooner than my 18 year hiatus. We would spend the weekend in the lovely high end town of Bath and then head to Glastonbury, the curious tiny town that had become a mecca for all things New Age. Friends at home followed along on flickr as I uploaded pictures each night. Narrating the photos also kept my trip data in order for future reference. This was a working vacation. I wanted to get my money's worth, though it meant I slept about 5 hours a night, and napped so much during the day, that Catherine said I was missing half the scenery. The Ancient Sites Tour not only fulfilled my expectations, but confirmed my path. Freddy so consciously used the English language to reveal layers of meaning that I'm saving the experience for an essay of its own. After the tour, we journeyed to the home of old family friends in Cornwall. Arriving late in Penzance, we were thankfully met by Aidan (whom I had first met when he was ten or so and I was 18). He drove us to the family farm where he lived with his husband Patrick, a prolific novelist. We offered to take Aidan out to dinner, but he told us they were having a dinner party at home with a few friends and he hoped we wouldn't mind joining them. He had cooked for it too. When he took us into the dining room to meet everybody it was clear that everyone was gay. How delightful. We couldn't have felt more at home. There was even a lesbian couple, Carol and Jo. They each gave me the universal, gripping handshake of the tribe. While the men gently pressed my hand, towering over me in flowing linen garments. Two were professional artists. A third guest, of this illustrious crew, was an actor. We were on review, I realized; the guests of honor by dint of having come so far and being related through my mother who was Aidan's mother's best friend when they were ten. I explained how our train had developed a malfunctioning whistle so, due to safety requirements, we had to get off and catch another. When asked how many days we had been in England, I said it seemed like three times as long because we had crammed so much into our schedule. "You must be knackered," said Jo which made me laugh at such a word. Her loose blond hair fell to her shoulders, while her girlfriend Carol had hers short. Jo collected up her barking terrier and offered me a seat on the couch with her, while Patrick took Catherine into his care at the other side of the room with everyone else. Jo was soon asking me questions, just the two of us. Her diction was so distinct that, with each precise spacing and tightening of consonants, I felt my own diction bumped up a notch and my brain getting smarter as a result. Despite the seven hour train ride and half empty glass of champagne in my hand, my mind was seeking out all the layers of information in the conversation. She was asking me questions about how I talked to clients as a professional organizer. She knew enough about psychological terms to be a therapist, but not quite enough to confirm it. Later I found out she was a lawyer. No a barrister, she corrected me. (In England this means with robes and wigs and all.) Well no wonder. I could imagine hearing such diction ringing out in a courtroom drama from the 40s. But there was something else that was entering my head like a drug. Jo had a style that was so charming it flirted with flirting if you get my meaning. It was harmless enough; just a fun way to connect, but it was allowed. At home I spent so much energy trying not to flirt in this manner with straight colleagues at networking functions that I had to give up drink—and take up combative argument. I inherited the flirting gene from my English mother for by the time I was ending high school, my best friend (and first lover) was accusing me of flirting with her boyfriend adding the comment "And you didn't even know you were doing it." Americans don't often mix charm with inquiry. American lesbians, once they learned to flirt, did it broadly with low brow humor so was unmistakably flirting. How did I get this lucky to have entered the British reserve so delightfully? I was asking myself. Jo told me she had read one of my essays that Aidan forwarded to her; the one about building a composting toilet which, she said was verging on "barkers". "Barkers" is a word I've only heard once in a movie with Meryl Streep and I was beside myself laughing at the Britishness of it. Its meaning could not be mistaken, as in barking mad, "mad dogs and Englishman" i.e. just plain crazy. It made me laugh to hear it again. It cost Jo something to offer this assessment so I knew she meant it. (Doubtless, others of my readers thought the whole composting toilet project was barkers too. Catherine wasn't too keen on it at all, but it earned me rank with the eco living crowd.) What Jo really wanted to know, I felt, was how attached I was to the character I represented in that piece. By this hour, I was so not attached to anything I ever stood for, I was in danger of trading it all in for a life in England. So in love was I with the beauty of the land, the language and the life there. "I've always wanted to have that adjective applied to me," I replied laughing. And so felt accepted. In contrast to Jo's charm, Carol was self-deprecatingly witty. The next evening as we set out to dinner at Aidan's parent's house, two fields away Carol said "I've had too much to drink. I'd best be kept on a short leash." This was so brilliant a use of self for own joke, my mind reeled at the implications. I might have quite a lot in common with Carol, I thought. As a landlord, she worked with tools and houses. She would offer what she knew if asked and I sensed that that was a fair amount. Everyone was so smart, we were beginning to feel intimidated. They were well educated, too—Patrick at Oxford even. Oxford was such a mythological place of highbrow learning, Catherine wanted to go there to experience it. We did go our first day out from Henley and had the mythology confirmed by the over-the-top architecture and the history. I secretly realized that if I had gone to Oxford it would have been even more difficult to escape. I would have had to have as much conviction as, say, Oscar Wilde (an Oxford graduate). Reporting from The Barking Edge takes gumption (and dang it someone has to do it). Aidan's mother, June, welcomed us into her home with such goodwill and down to earth commentary, we immediately felt at ease. But it was too late, for I had already internalized the British sense of modesty and was beginning to pull up on the reins. I was watching myself choke the emotion from all my stories and redirecting them to some other subject besides me. I could no longer use myself as a foil because it just seemed too self-indulgent to even be in the picture at all. I felt apologetic. Soon I would have to get a real job. Even Patrick, the natural leader of the conversation, as a professional story teller, asked questions that didn't require emotional content, so careful was he to protect your privacy for you. Not like our lot in California who don't think something is real until you tell them how it personally made you feel. I needed that reflected back to me so I would know that people were interested. In retrospect the British probably needed that too. Next time I visited, I vowed, I would come armed with a bigger bark.